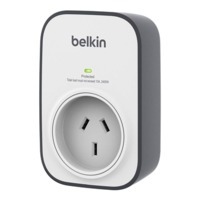 26.47% of people buy Belkin - 1 Outlet Surge Protector and Belkin-4 Outlet Surge Protector - 2 Metres. Ideal for the laptops and basic household devices, the Belkin BSV102 1 Outlet Wall Mount Surge Protector safeguards small electronics from damaging voltage fluctuations, surges, and spikes. Designed to work with laptops, basic household devices and small kitchen appliances.